I'm obsessed about turning off the light when I leave the room. The laundry room, bathroom, and especially the closet; the light always has to be turned off. Now with this new Commodore 64 game from Avatar, I can role play and be the one who always leaves the light on. 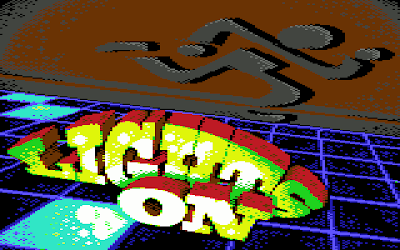 Lights On is a puzzle game in which the objective is to light all the tiles on each of the 24 single-screen levels. Using a joystick, you control a character that moves around the grid of tiles lighting each tile it touches, and landing on a tile that's already lit turns it off again. 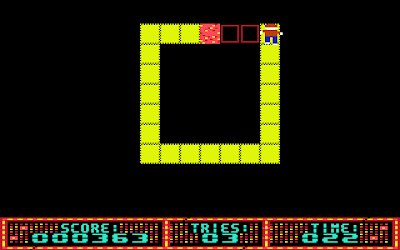 Some levels take advantage of this mechanic, requiring you to move back and forth over tiles several times to turn them all on. Also scattered around the grid are arrow tiles that push your character in the indicated direction and teleporters can be used to instantly move to another corresponding tile. But we warned, this isn't a leisurely stroll of reckless lighting; a timer counts down at the start of each level. If you run out run of time you lose one of your five lives. Fortunately, some levels include a tile that add seconds to the timer - and you will need it, as there isn't much room for error. But wait, there's more! 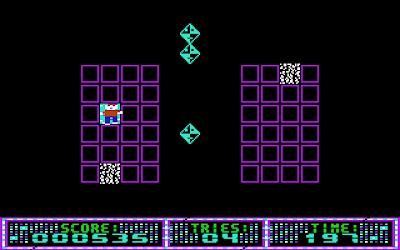 Level three introduces sparks, enemies that move horizontally or vertically until they hit the edge of the grid and then reverse course. After they return to their starting position, they move in a new direction, keeping you on your toes. Your only method of protection is to stand still and hold the fire button to activate your shield allowing them to pass through you, losing valuable seconds in the process. Adding a reaction element to a puzzle game is a bold move, yet it pays off well here. The levels are undeniably challenging. 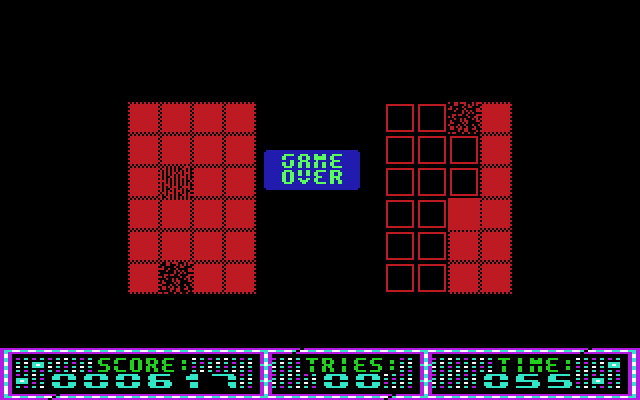 The game starts off with a straightforward grid but the difficulty curve soon ramps up, and most levels took me a few (okay, a bunch) of tries before I finally got all those tiles lit. 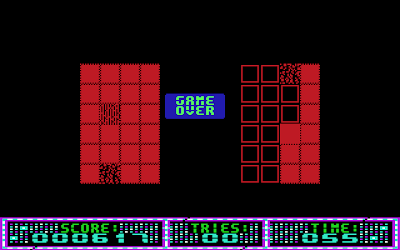 Repeated attempts at completing a level are a little frustrating - made more so by the fact that in a few cases the enemies hover near the edge of the grid making it almost impossible to predict their movement. It's not impossible, but certainly old-school difficult. 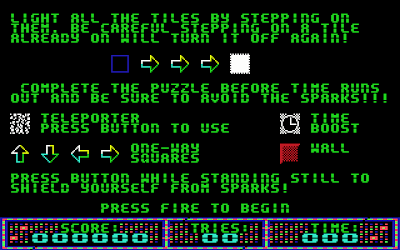 Aside from the beautiful title/splash screen, the rest of the graphics are extremely simple - looking much like an early era C64 or ZX Spectrum game - but they are arguably clear, effective and don't distract you from the task at hand. However, the controls are more than slightly unresponsive, which is most noticeable when making quick direction presses. On several occasions my character either didn't move when I needed it to or, more often, moved one tile too many and (annoyingly) turned off an already lit tile. Also, this slow response means that activating the shield requires a little extra planning since you need to press the fire button a split-second before you actually want it to activate. Well, my role playing as the deviant who always leaves the lights on has come to an end. Lights On is a well designed little puzzle game with considerable challenge and variety, sadly marred by unresponsive controls and crude in-game presentation. With a little more attention and TLC, Lights On could have been a winner.